Support Your Independent Stockport Old Town Traders This Christmas! Christmas is upon us so I’d like to give a shout out to the independent traders of Stockport Old Town! If you too are a Stopfordian dreading the thought of battling round Merseyway or Manchester and you’d rather give your cash to someone who’ll appreciate it instead of Amazon, you’ll be pleased to know there are plenty of brilliant options to do your Christmas shopping in Stockport Old Town! Since setting up Paul Jardine Web Design in 2014 I’ve built up a first hand appreciation for anyone running their own business and it’s been amazing to see new shops opening up in the area over the past three years. Here are just a few of the businesses I’ve had the pleasure to visit, all of which are run by friendly people with a great knowledge of their products and a genuine passion for what they do. 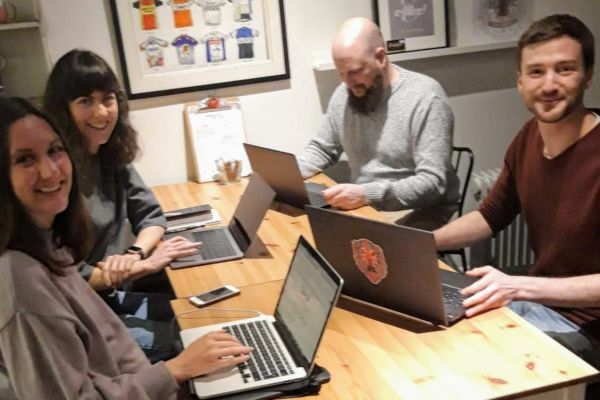 Tandem Coffee House, based on Lower Hillgate near Robinson’s Brewery, are selling a fantastic range of Christmas gifts including cycling themed teawear and artwork as well as artisan tea and coffee to brew at home. They also sell cracking coffees and the best cheese and marmite toasties in town! Next door to Tandem you’ll find Double 4 Records which has a massive collection of second hand vinyl at good prices. Plant Shop Manchester, which opened on Mealhouse Brow in August, has a massive collection of house plants, succulents and cacti as well as Christmas trees! They also stock handmade jewelry, ceramic plant pots, soy candles and illustrated Christmas cards. You can even book workshops to make your own ceramic planters in the new year. Chambers Skate Shop, also on Mealhouse Brow, have a big selection of skateboard equipment including independently designed decks as well as clothing such as t-shirts, headwear and trainers. Whether you’re a seasoned skateboarder or want some cool clothes Chambers is well worth a visit! If you are looking for Christmas dinner, Stockport Market Hall is home to several green grocers (Loraine and Fred are absolute legends! ), a butchers stall and an excellent deli. There is also a newly opened wine shop, a well stocked craft beer stall and a sweet shop. You’ll also find my most favourite shop of all, Charlies Cheese! Speaking of food, Friday 15th December will host the last Foodie Friday event of 2017. Foodie Friday is Stockport’s monthly community street food event taking place in the market square on the last Friday of the month. The event features top food traders from around the North West as well as live music from some fantastic local bands at Seven Miles Out. This blog only really scratches the surface of all the awesome shops in the Old Town area so my advice is to go have a look around and see what you can find! You can also find out more at StockportOldTown.co.uk. Hear me talk about web design, teaching people to get the most from their websites and much more on the Creative Conversations Podcast with Lucy Butler Digital!